AM-119: AM-119 was awarded to Seaboard World Airlines. 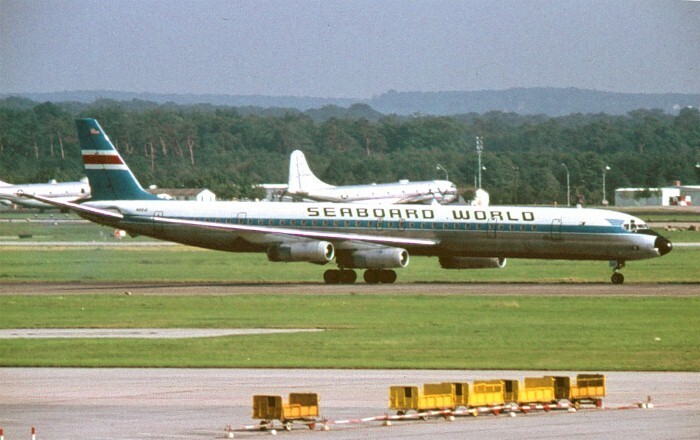 Seaboard World Airlines was an international all-cargo airline based in the US. It was founded by brothers, Arthur and Raymond Norden on September 11, 1946 as Seaboard & Western Airlines and began operations with a flight to Europe in May 1947. Seaboard concentrated on freight charters until it was authorized to operate scheduled freight services across the Atlantic which started in April 1956. On April 4, 1961 Seaboard & Western's name changed to Seaboard World Airlines. Jet cargo service started in 1964 with the introduction of the Douglas DC-8. Seaboard played a prominent role in the Vietnam War during the late 1960's using the DC-8 Super 63 jets to connect McChord Air Force Base WA with Cam Ranh Bay, Vietnam, fairly close to the front lines with North Vietnam.